Q. Marcius Q.n. Philippus was one of the moneyers for the year 129 BC. He is not otherwise known. Gens Marcia, occasionally written Martia, was one of the oldest and noblest houses at ancient Rome. They claimed descent from the second and fourth Roman Kings, and the first of the Marcii appearing in the history of the Republic would seem to have been patrician; but all of the families of the Marcii known in the later Republic were plebeian. The first to obtain the consulship was Gaius Marcius Rutilus in 357 BC, only a few years after the passage of the lex Licinia Sextia opened this office to the plebeians. 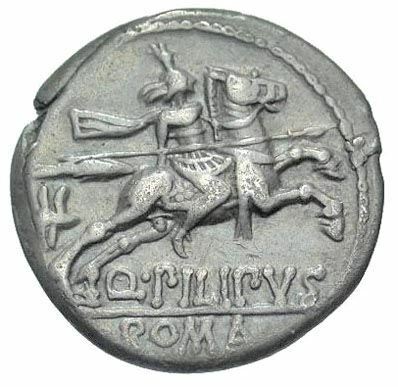 The Marcii are supposed to have been Sabines, descended from a certain Marcus Marcius of Cures, a kinsman of Numa Pompilius, and his son, Numa Marcius, a childhood friend of Pompilius, who accompanied him to Rome and served as his chief advisor. His son, the younger Numa Marcius, was urban prefect under Tullus Hostilius, and his grandson was Ancus Marcius, the fourth King of Rome.